Hansen's Sno-Bliz 2010: Four New Flavors! I gave up going to Italian restaurants in New Orleans a long time ago. None of them ever gave me what I was after. I craved restaurants more like those I've experienced in tha San Francisco Bay area like Oliveto, Incanto, the blissfully Sardinian La Cicca or even Delfina Pizzeria . I wanted local ingredients, house cured salumis, handmade pastas! New Orleans doesn't really do artisanal, rural Italian food. At least it didn't (that I knew of). When I heard that Domenica and a Mano had opened, both offering just these things, I was thrilled. For my birthday, we went to a Mano for the first time. What a treat. We started with glasses of Fantinel Prosecco di Grave. They are currently doing a version with local strawberries as well but we stuck with it straight. I am crazy for salumi so I greedily ordered the Affetati Misti even though I knew Kid Cayenne wouldn't be eating any of it. 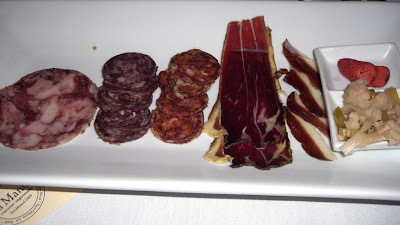 The plate of house-cured meats included duck and lamb which were both delicious. A bit of pickled vegetables and a pickled strawberry helped cut the richness of the meats. Pickled strawberry! I could only eat about half, but brought the rest home for a snack. 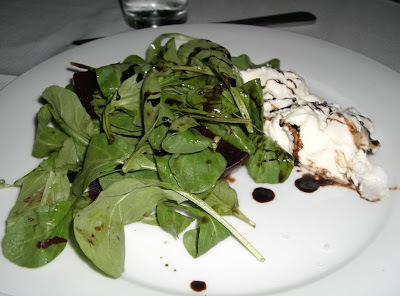 Kid Cayenne ordered the Burrata con Barbietola e Balsamico (Burrata cheese, roasted beets, balsamic and local greens). It was great and I stole many bites from her plate. Creamy and sweet, balanced by the beautiful pepperiness of the arugula and tartness of the balsamico... wonderful. We considered making a meal of starters but in the end decided to try a couple of the entrees. 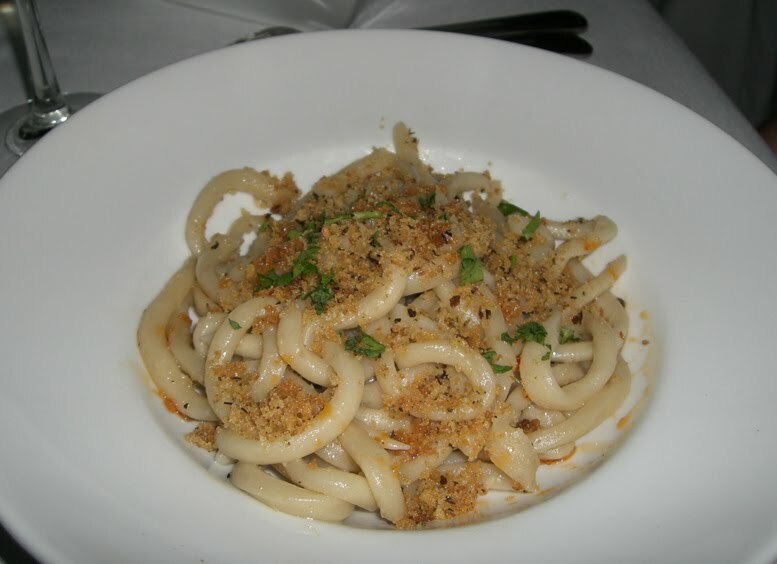 Kid Cayenne got the Pici all'Aglione, handrolled pici pasta with olive oil, garlic, chili, parsley and breadcrumbs. It sounded perfect for her right off the bat but when our server warned her that it was very garlicky, it became all the more alluring. This was incredibly good! The pasta was perfect, the seasoning was perfect, the texture from the toasted bread crumbs was also perfect. For such a simple dish, it was executed beautifully and I wish I had more of it right now. Kid also ordered a side of Rosemary Potatoes. Again with the perfect. Just stupidly delicious, really. 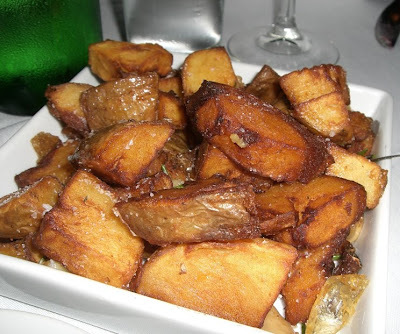 I mean, I know... it's just potatoes, but so crisp, so golden, so beautifully seasoned. Crazy, crazy good. I wonder what they cook them in. I should have asked. I ordered the daily pork preparation and maybe I could have made a better choice because after the salumi, I had had quite a bit of meat (and fat) already. The pork selection was thick slices of coppa, braised and then grilled. 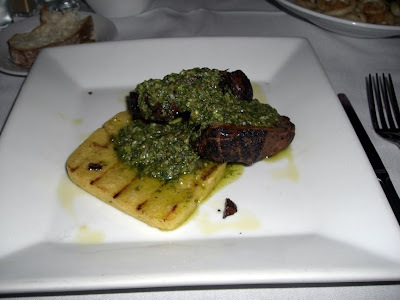 They were placed over a thick slice of grilled polenta and then topped with a salsa verde that included capers, oregano, and a few other nice things that I've forgotten already. The dish was nice, but rich and so meat-centric that I couldn't finish it. I might have done better by ordering one of the pasta dishes. Next time. Our server provided excellent service and advice, recommending lovely glasses of wine and two delightful desserts. 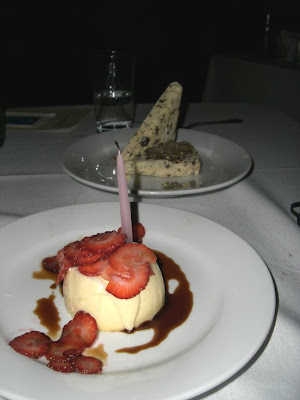 We got the chocolate and pistachio semifreddo (packed to the rafters with pistachios, yumyum) and the panna cotta with saba and strawberries. Both were nice. Not outstanding, but quite nice. I was happily surprised by the relative affordability of the menu because it means we can go again soon. I am truly looking forward to it. Highly recommended! P.S. No parking, no valet but two pay lots within 2 blocks. We just tried it too! The hits of our dinner were the insalata di mare, the antofogatta dessert (homemade fiore di latte ice cream in an espresso with a biscotto), and the housemade amaro (after dinner drink I wasn't familiar with). I loved that they sprinkled big chunks of sea salt on the buratta. The cured meats at Domenica are also fantastic. I can't wait to try the insalata de mare next time. I was *this close* to ordering it when I went.